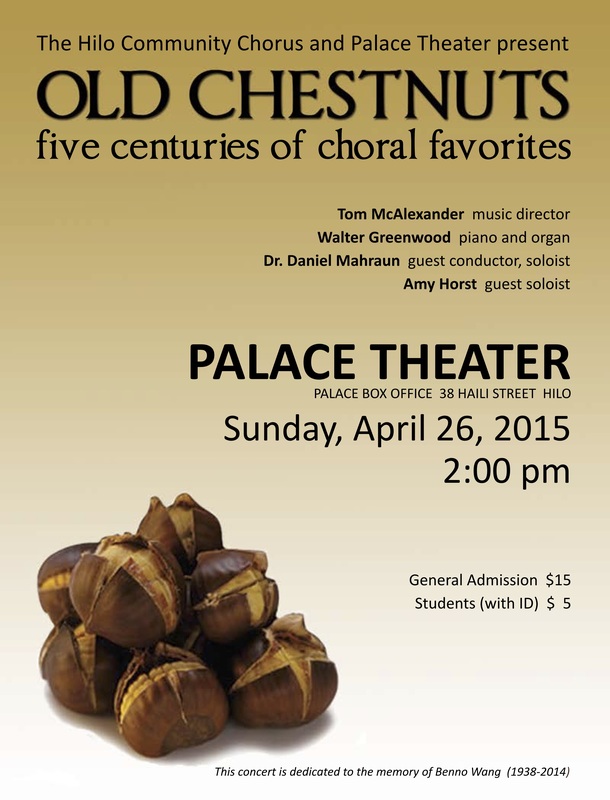 On Sunday, April 26 at 2 pm, the 60-voice Hilo Community Chorus, with distinguished soloists and a special guest conductor, will offer its annual spring concert at the Palace Theater. The concert is dedicated to the memory of Benno Wang, a chorus member of HCC and the Kanilehua Chorale, and a beloved member of the Hilo community. The Chorus invites all to come and hear “greatest hits” from five centuries of composers that will include Tallis, Mozart, Beethoven, Haydn, Brahms, Gounod, Steiner and Jenkins. Soloists will include local favorites Amy Horst, Jaime Juarez, Ian McMillan and Michael Hurkes. McAlexander will be joined on the podium by distinguished conductor and composer Dr. Daniel Mahraun, now of Kailua-Kona. The Chorus will be accompanied by two versatile and talented musicians, Walter Greenwood on piano and organ; and Karen Nogami on oboe for one number. The Chorus will also present two, first-ever, “Tom McAlexander Choral Music Scholarships” to two UH choral music students – in honor of their beloved conductor.